We produce all kinds of pork products from: sausage, bacon, pork chops, roasts, bratwurst, and many more. But unlike traditional store bought pork, our pigs are raised on pasture. They forage for a majority of their diet; grass, roots, etc. just as they would in their natural habitat. We provide a non-gmo grain ration free-choice, as the pigs are not ruminants like cows and cannot survive on pasture alone. This ensures that the pigs get a well-balanced diet that they choose. Keeping our pigs on pasture reduces odor problems, distributes manure (traditionally a hazardous waste in confinement operations), and creates a lean, healthy pork product unlike anything many have tasted. It both tastes great and is healthy for you. 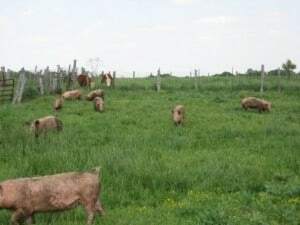 After the pigs are finished with a pasture and are rotated to the next, we allow at least 90 days of rest which allowed the grass and land to re-grow stronger than before.